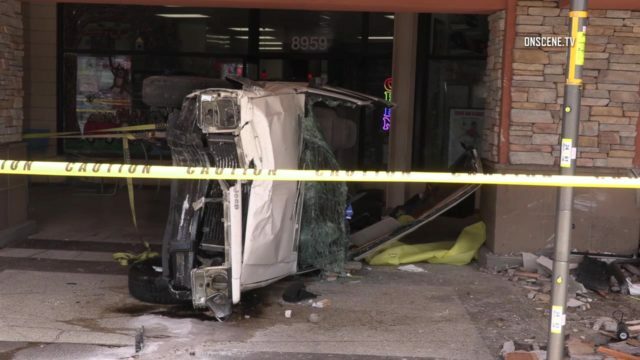 A driver crashed his car into a doughnut shop in Santee Sunday, and had to be extricated from the wreckage. It happened just before noon at Mary’s Donuts, on Carlton Hills Boulevard near Mission Gorge Road in Santee, according to San Diego County Sheriff’s Sgt. David Pocklington. Responding deputies found the car rolled onto its side, requiring firefighters to use the “Jaws of Life” to extricate the driver, who was described only as a man. The driver suffered a leg injury and was taken to an area hospital, Pocklington said. There was no information on his condition. Due to the damage to the front of the building, firefighters requested an engineer to evaluate the structure’s safety, Pocklington said. Adjacent businesses were closed at the time of the crash and no other injuries were reported, he said.